Thanks for all the lovely comments on my little pouch design that I shared yesterday. Now that my trusty Pfaff is sewing smoothly again, I was able to complete the tutorial today. 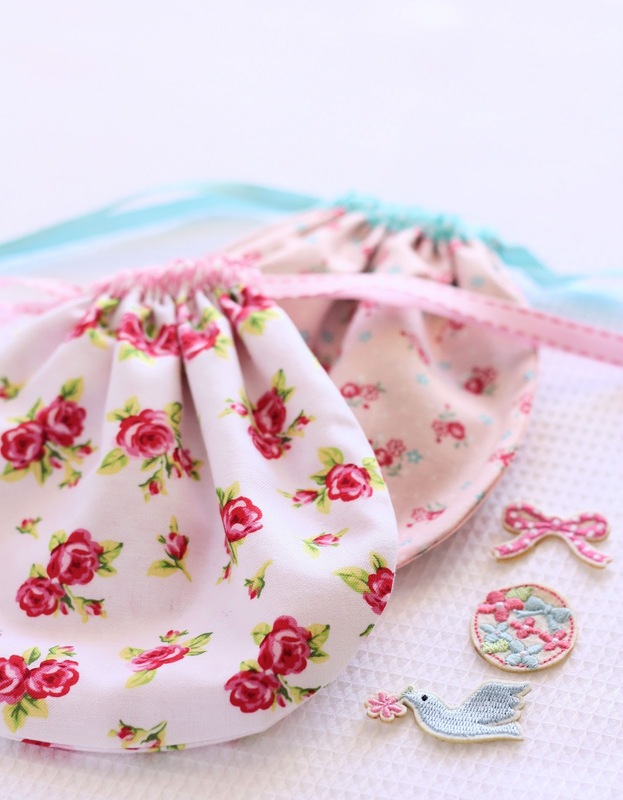 If you are after a little drawstring pouch to hold a few essentials or to use as gift packaging, the Pretty Drawstring Pouch will fit the bill. Made from two fat 1/8’s of quilting cotton and a length of ribbon, it can be made in under an hour. The lining is folded over to the front to make a contrasting casing for the drawstring. It is sized at 6 1/2 x 6 1/2 inches (16.5 cm x 16.5 cm). Note: Seam allowance of 1/4 inch included. 1. Using the template, cut out two outer pieces (floral), and two lining pieces (polka dot). 2. Place the two outer pieces (floral) with the right sides facing. Stitch around from one side to the other, leaving the top open. Clip corners. Press. 3. Place the outer pouch on top of the lining panel (polka dot) and make a mark with a water soluble pen, just above the stitching line on both sides (as marked in Photo 3). Pin the two lining pieces together with the right sides facing. Stitch from the mark on one side around to the mark on the other side. Clip corners. Press. 4. Clip the seam of the lining at a 45 degree angle as shown in Photo 4. Repeat for each side. Press the seam allowance open. This will form part of the casing. 5. Stitch around the seam allowance on both sides of the casing as shown in Photo 5. 6. 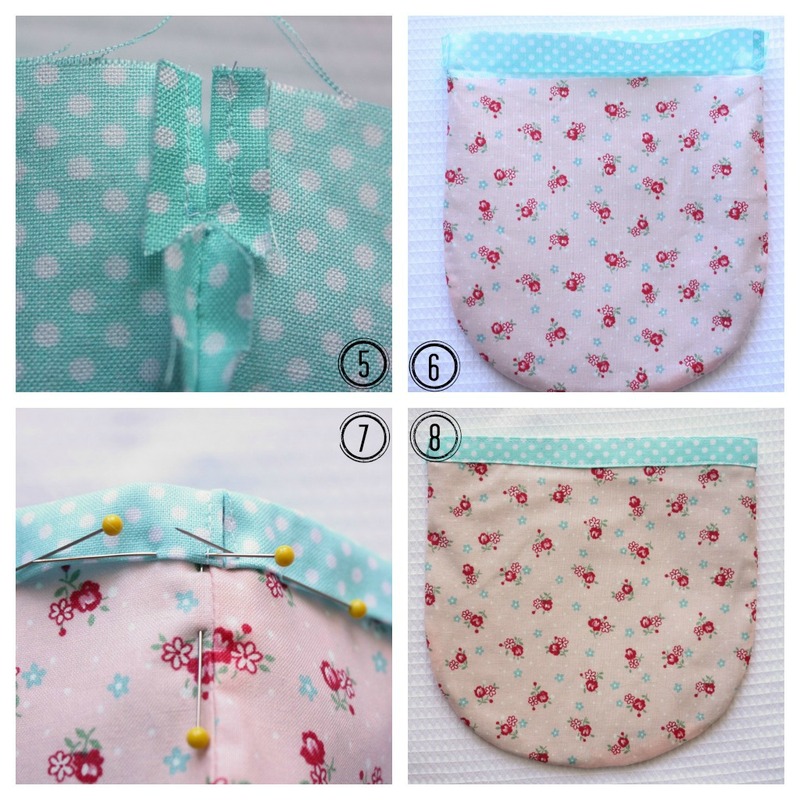 Turn the floral part of the pouch so that the print is facing outwards. Place the lining inside the pouch. There will be 3/4 inch (2 cm) of the lining showing at the top and this will form the casing. Press this part of the lining down so that it is level with the top of the pouch. Fold under 1/4 inch along the edge of the casing. 7. Pin the casing in place. 8. Stitch along the top and bottom edge of the casing. Cut the ribbon in half lengthwise. Using a safety pin, thread the ribbon through the casing on one side, and right around to exit on the same side. Repeat with the other piece of ribbon from the other opening. Knot the ends of the ribbon. Press. And there you have it – a quick little pouch to hold all manner of things. We have modified the pattern to make a larger drawstring pouch over on this post. Edit: Pink fabric is 30’s Collection Atsuko Matsuyama, Lecien; White fabric is Tweet by Timeless Treasures. 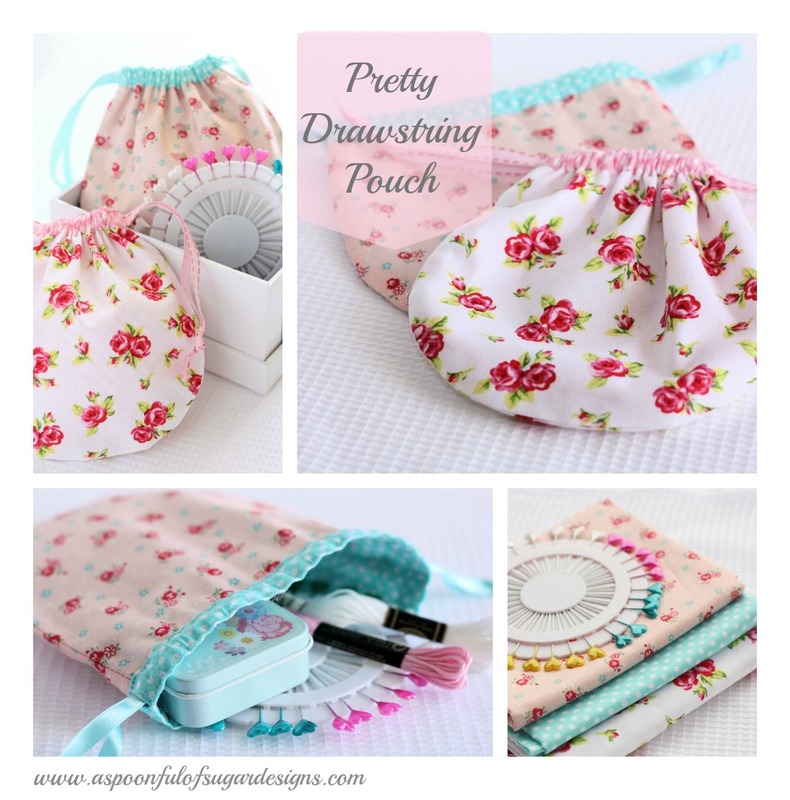 Check out the Pretty Liberty Drawstring Pouch variation. 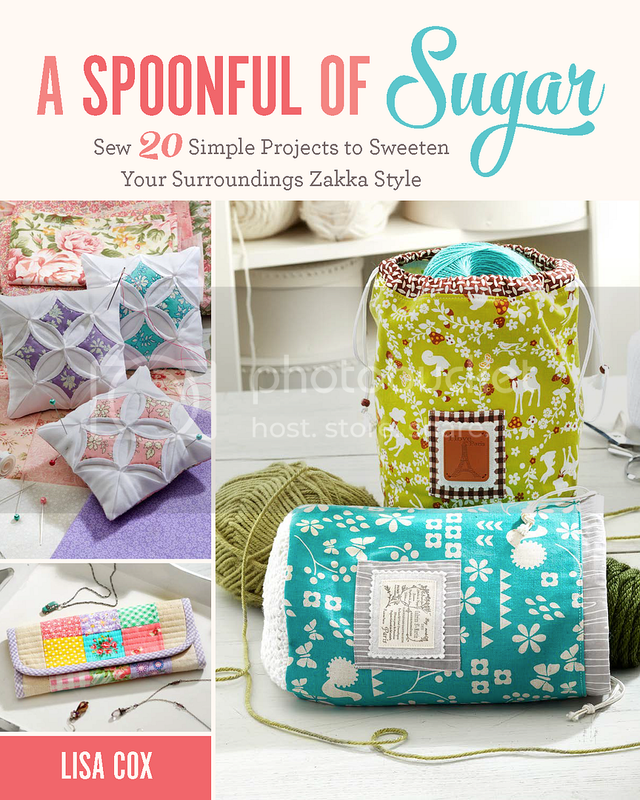 For your daily sugar fix you can subscribe or follow us on instagram, facebook, twitter, google plus and pinterest. It is so lovely. It makes me want to pet it and touch it. The fabrics and your technique are beautiful. This is so pretty! Thanks for the tutorial! Thank you thank you for posting the tutorial! So sweet and darling. I’m sitting down this very second to make one! PS. It was a needle problem for my Pfaff too! So glad you had posted about it! Thank you for this fun tutorial! What lovely pouches. Thank you for the tutorial. aargh!! i have never had trouble downloading your patterns before, but this time it says i have to log into facebook — alas, i have decided to stay out of it and have no account. Sad, sometimes things work out that way! thanks anyway — cute pattern! Thank you so much for sharing. It is really a sweet lil pouch. I really love this kind of bag! Thank you so much for the tutorial!! What a sweet pattern – thank you so much, girls. I’ve just finished making my first one from scraps at home – love it. I think these will be my ‘go to’ stocking stuffers this year. Thanks for the tutorial. it helps me so much. Love the fabric you used, do you know who makes it, or a name for the fabric patterns? This is great! I am using a bunch of old Christmas fabric I found at a thrift shop to make little gift pouches for a local nursing home. Filling them with goodies. Love the tutorial! I love this little pouch. My grandaughters would really like these. Will have to get the pattern and see what they think. Thanks! Would love to make this – such a cute pattern. Like Rita, I’m struggling to download template. Any tips? That is stinking cute. Love the curvy shape of this. Might make a cute gift bag for tiny things like jewelry. Such a sweet bag ~ I found your blog from ‘Sew Can She’ feature of the day. adorable..going to make one up for my new daughter-in-law to carry at the wedding on friday:) thank you. Thanks for the tutorial! So pretty! Beautiful things You do. Thank You fot this tutorial. For sure. I am also a blogger too. It’s the prettiest drawstring bag I have ever seen. vous faites des merveilles et merci pour vos bonnes idees; avec les fetes qui arrivent, voila une idee geniale pou faire des preents car un present fait main a beaucoup plus de valeur!! Very clever having the lining form the casing!!! Thank you for the great tutorial. I made the pouch with Christmas prints and just wanted you to know that I linked your page on my blog! Parabéns pelos trabalhos e as dicas para facilitar, muito boas, um abraço a todos. Me encanta vuestro blog ,teneis cosas preciosas ,me hago seguidora para ver mas cositas de las que haceis ,un beso. 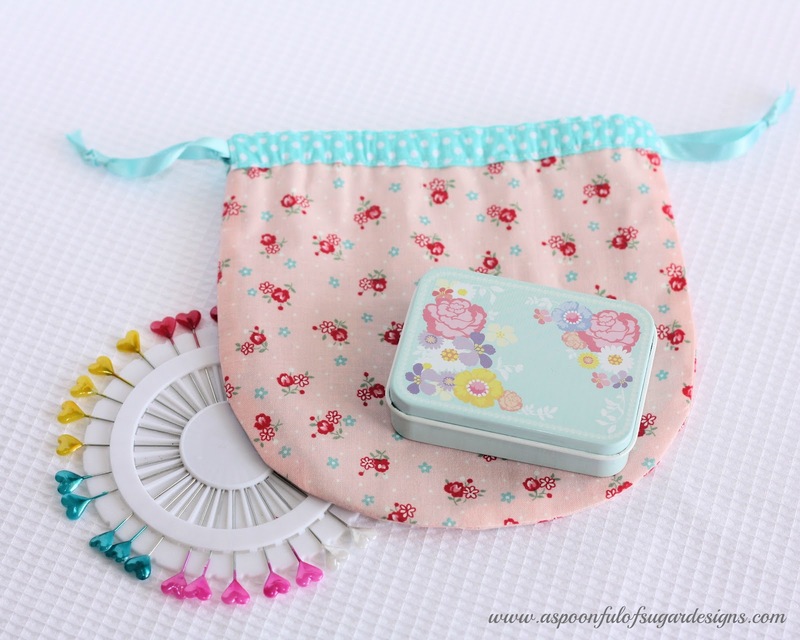 Beautiful Pouches and easy to follow tutorial. I am now following you and looking forward to seeing more projects. Thank you for sharing this tutorial. I am going to try this soon. For now I Pinned it!! Thank you so much for this fabulous tutorial! I just made one of the bags and posted it on my Flickr, along with a link to this tutorial. Thank you for the lovely tutorial. My 10 yo just made her own version of this pouch. Excellent instructions. I’ve been looking for a small pouch for my granddaughter and, when I saw yours, I just knew it was the right one! Thank you so much for sharing it! Wow. The box pouch and, this. All you do is copying those Japanese creator’s projects then post as if they are your invention. What a nerve. Very creative, ladies. I suggest you to look up a word Moral in a dictionary. And don’t think you can fool everybody because some people know where these designs come from and that they are not your ideas. Thanks for commenting Zoe – we always appreciate feedback from our readers. You will notice that I did link to the book Patchwork Please in my Box Pouch post and gave credit to Ayumi Takahashi for her design. 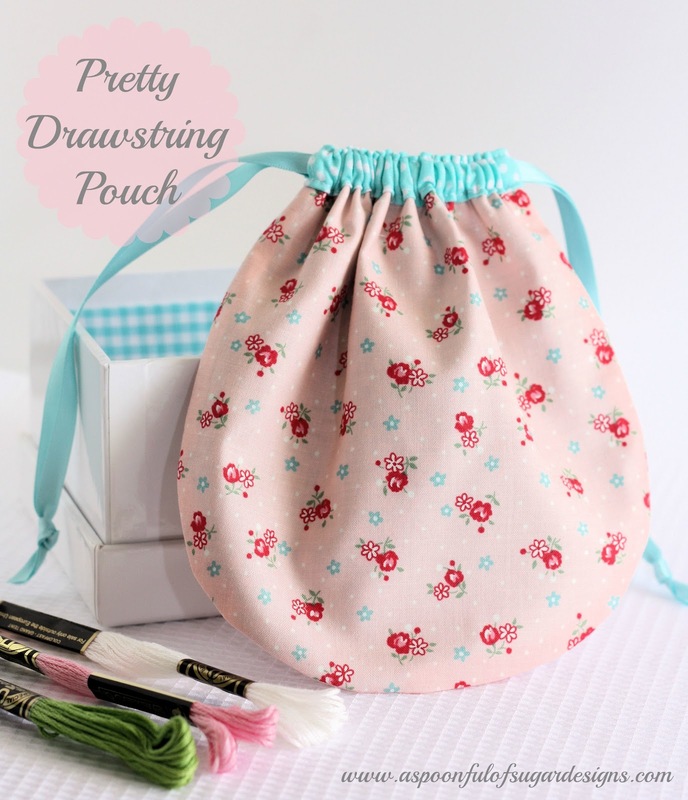 The template for the Pretty Drawstring Pouch one was drawn by me and not copied from another designer. There is nothing original about a drawstring pouch, or a box pouch, and there are loads of variations around the internet and in books. Most craft projects are not that original – it you look on pinterest you often see the same type of project appear with some minor variations. We simply share our tutorials (which take hours of work to photograph and write up) as a way to help others learn to sew some basic projects. I’ve been using this pattern (very slightly modified — I increased the overall height of the lining so that the top is a little wider) to make dice bags for my friends and fellow gamers. It’s been a fun way to use up some of my stash, and I even got the chance to teach a few of my friends the basics of a sewing machine. I use a lot of jersey knit fabric (mostly old tee shirts) but I’ve also used some heavy linen, standard fat-quarter cotton cloth, and some velour as well. This makes for a quick and satisfying project, and I wanted to thank you for sharing it. Great idea making some of game pieces for game pieces! I’ve been looking for a tutorial like this for AGES! I have a huge collection of dice I use for board games and role-playing games and I can never find a pouch that I like online. I’ll be making lots of these to give away to my D&D friends. Thank you! Thanks Alma – it would be a great size for holding dice or small game pieces. Happy sewing! Thanks so much for sharing this cute project and pattern! I’m new to machine sewing and am having trouble getting from step 4 to step 5. Am I correct in seeing that the line of stitches forms a “u” shape, moving down one side of the casing and then over and up the other side of the casing? Any chance you could share some more detail on how to do this on a machine with the fabric folded over as your photo shows? Not sure if I’m describing my confusion coherently, but if you have any tips to help me through this step, I’d be thrilled! Thanks again! Hi Sarah – Sorry for the delay in responding – we have been on vacation for a few weeks. Hopefully you have sorted it out. Yes – the stitching is in a U shape. When sititching curves, you just go slowly. If you leave the needle in the fabric, then raise the presser foot and slightly pivot the fabric, then lower the foot again as you ease around the curve. You may find it easier to make a larger pouch first (see the link at the bottom of the tutorial). happy sewing. Hi! lovely little bag. I printed out the template ( 100% ) yet it seems to be too small for the dimensions you give above. You do say that SA’s are included but Im not sure. Amei está pequena bolsa, obrigada por compartilhar! 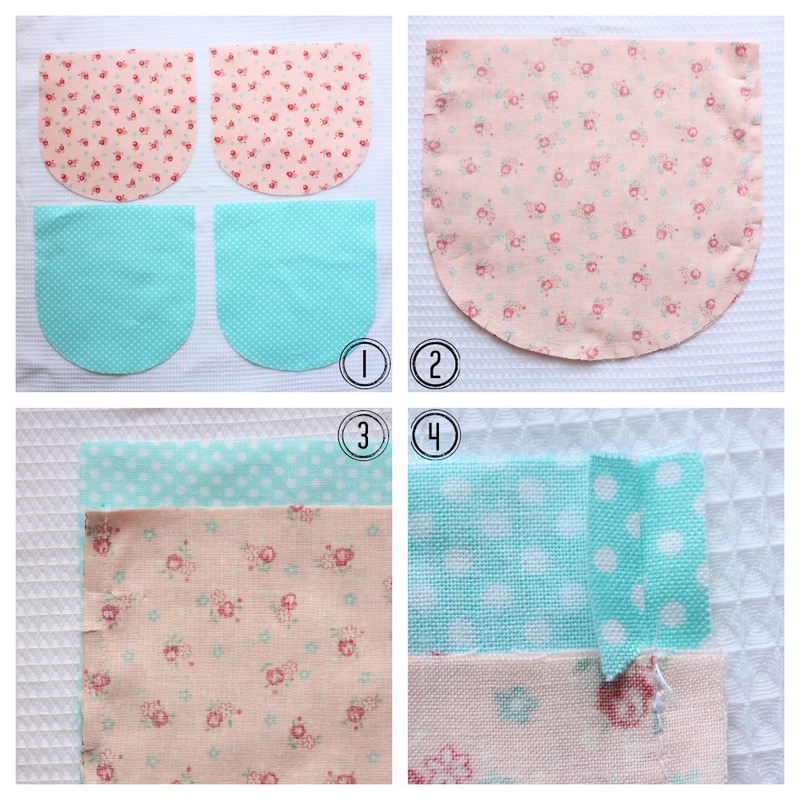 Thanks a lot for this tutorial : it’s a lovely pouch quick-sewing ! Thanks you! Best wishes for a happy and creative 2016! Thanks for sharing this cute tutorial. I like the rounded design – nice to have design other than squarish or rectangle. I have cute Halloween material, and will use this tutorial to make a cute pouch for her within a few days. Thanks Alicia – they would make cute Halloween treat bags.